The Witcher's grim monster hunter is getting his own series of comics, in which he - surprise - hunts monsters. CD Projekt, publisher of The Witcher series, hinted earlier this month that something was going on between it and comic publishing giant Dark Horse Comics. This mystery project has now been officially revealed as a series of The Witcher comic books, starring the games' protagonist Geralt of Rivia on a new adventure. The Witcher was a successful series of novels before it broke into the video game scene, so in some ways this is a return to form for the franchise. The Witcher comic series is set near the Black Forest, where Geralt meets a widowed man whose wife has returned as an undead monster. Geralt's investigation takes him to the House of Glass, a mysterious mansion filled with horrors. The series will be written by Paul Tobin (Bandette), with art from Joe Querio (Lobster Johnson, B.P.R.D.) and cover art by Dave Johnson (100 Bullets). "We're very happy to be working with Dark Horse Comics, which is one of the biggest and most interesting comic book publishing houses in the world," says CD Projekt RED boss Adam Badowski. "What makes it even more exciting is the fact that, for many of us, the Dark Horse logo has near legendary status, standing for classic characters such as Hellboy or Usagi Yojimbo. We're very happy to be once again expanding The Witcher universe." 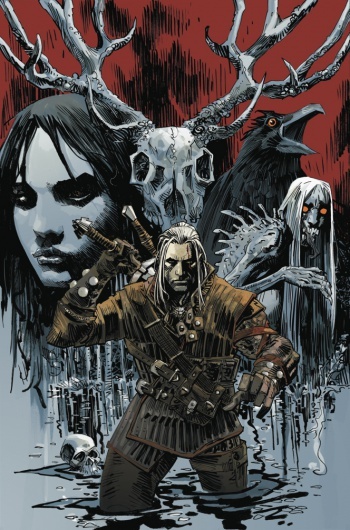 Witcher #1 will be hitting comic shop shelves on March 19, 2014.